As you all know, I love any opportunity to combine activities while visiting the Disneyland Resort. With limited time to spend at the “Happiest Place on Earth,” I am always on the lookout for different packages that maximize my vacation experience. One of my favorites is the Fantasmic! dining package! Beginning in the early 1990’s, I vividly remember the first time I saw Fantasmic! as a child. I was awestruck as Mickey battled epic villains and sweet princesses floated by on their rafts. Since then, watching Fantasmic! has remained on my “must-do” list when visiting the Disneyland Resort. This is why the Fantasmic! dining package is the perfect fit for my family. Fantasmic! currently has dining package options at three different restaurants: Hungry Bear, River Belle Terrace, and Blue Bayou Restaurant. 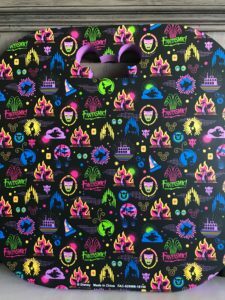 Each package comes with a voucher to watch Fantasmic! from a different reserved area. 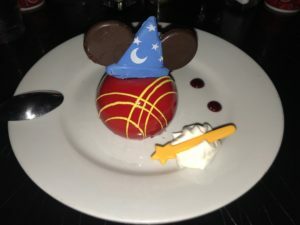 Blue Bayou is my favorite restaurant in the Disneyland Park, mainly because of their one-of-a-kind ambience inside the Pirates of the Caribbean attraction, as well as how terrific they are with food allergies. We always eat there at some point during our vacation, so we picked this option for our dining package. Even though we chose the Blue Bayou, both Hungry Bear and River Belle Terrace are great choices for many families. Hungry Bear is the most affordable, with an “on-the-go” meal option. Since this takes less time than eating at a table service restaurant (aka, less time trying to keep your kids quietly entertained! ), it is is another good choice for young children. Fantasmic! dining packages are popular and tend to sell out quickly. We made our reservations on the Disneyland website on the day they became available, which is usually 60 days in advance. Make reservations 60 days in advance at disneyland.com or by calling Disney Dining at (714) 781-3463. Note any food allergies in your reservations. They have a checkbox for the most common allergens and the rest fall under the category of “other.” This ambiguity left me unsettled the first time I made a reservation, but once at the restaurant, it has never been an issue. 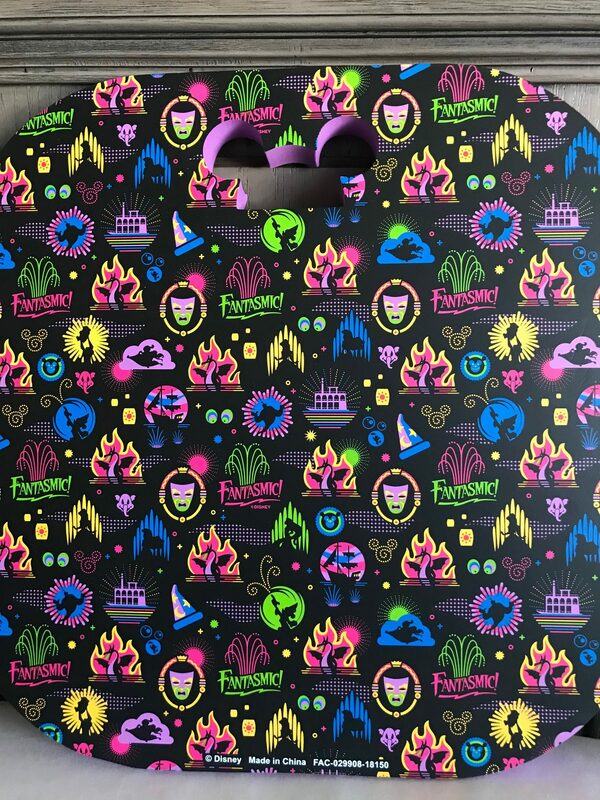 If there is more than one Fantasmic! 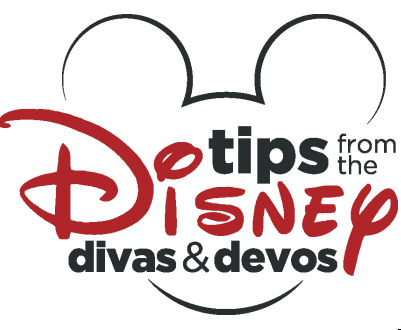 performance scheduled on the day of your visit, be sure to pay attention to which Fantasmic! time corresponds with your dining reservation. I prefer the first performance, as allows us to watch the nightly fireworks from our Fantasmic! location and it gets the kids back to the hotel earlier. The Blue Bayou Restaurant is unique because it is located INSIDE the Pirates of the Caribbean attraction. 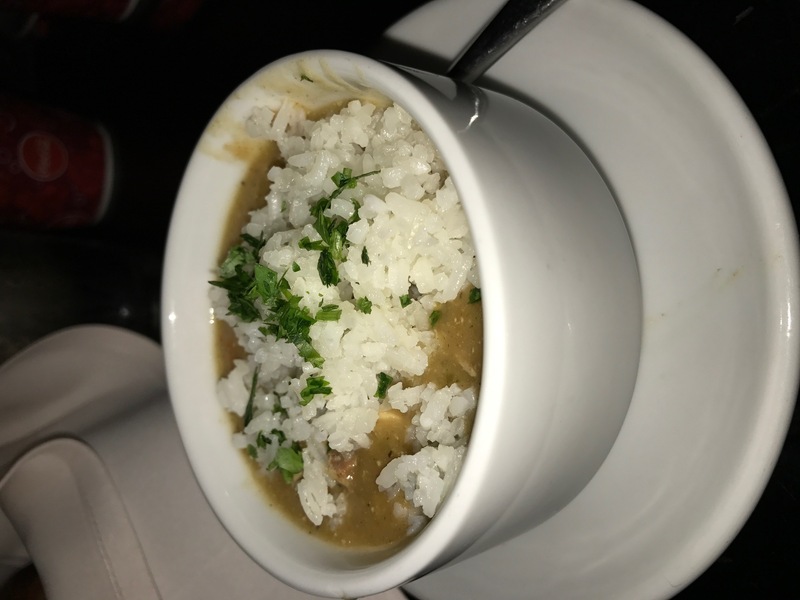 Regardless of the time of day, once you step inside the doors of the restaurant, you are quickly transported to a cool, summer evening on the Bayou. It is simply magical! 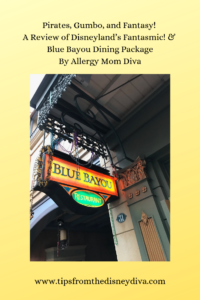 If you have’t been to the Blue Bayou Restaurant before, check out InspireDiva’s and Dland Diva’s reviews. Like we always do, we arrived at the Blue Bayou Restaurant a few minutes before our reservation to request a waterside table. Our request was quickly fulfilled, and we were seated within fifteen minutes. 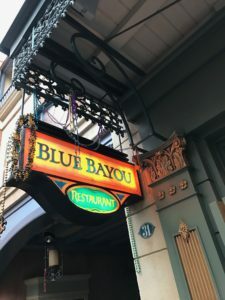 The Blue Bayou Restaurant is a small restaurant with tables close together, so sitting next to the water gives us a bit more space… and less chance of our children bumping their chairs up against the neighboring guests. Not to mention, sitting by the water gives us countless opportunities to wave (or shout “yo ho,” as my child may have done once or twice) at guests riding on the Pirates of the Caribbean attraction. 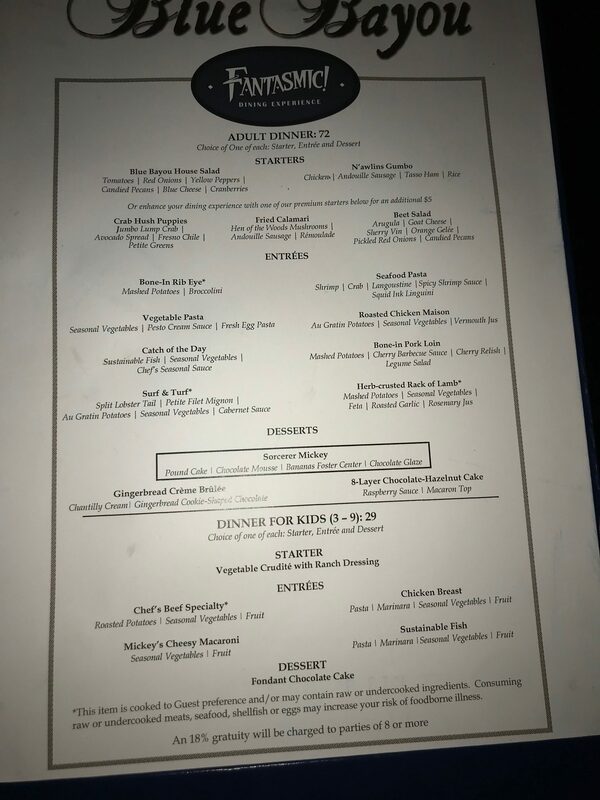 Once seated, we were given the menu for the dining package and an allergy menu for my child. 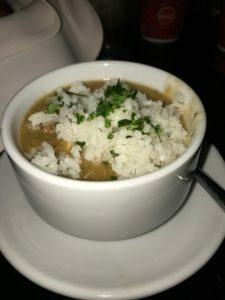 There is a special three course menu for the package, which consists of the Blue Bayou Restaurant’s most popular dishes (including the gumbo appetizer…my favorite!). At $72 for adults and $29 for kids aged 3-9, this is a true splurge expense for a family. On a side note, if this is out of the budget, both Hungry Bear and River Belle Terrace have lower priced options. 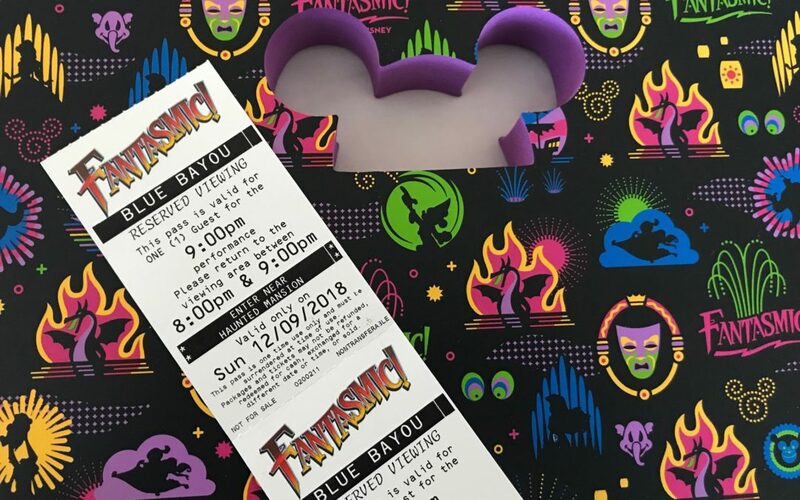 Disney Fastpass tickets are also available for Fantasmic! at no charge. FASTPASS tickets are available on a first come, first serve basis at the FASTPASS service machines located along the Rivers of America. Ok, back to the most important part – the food! 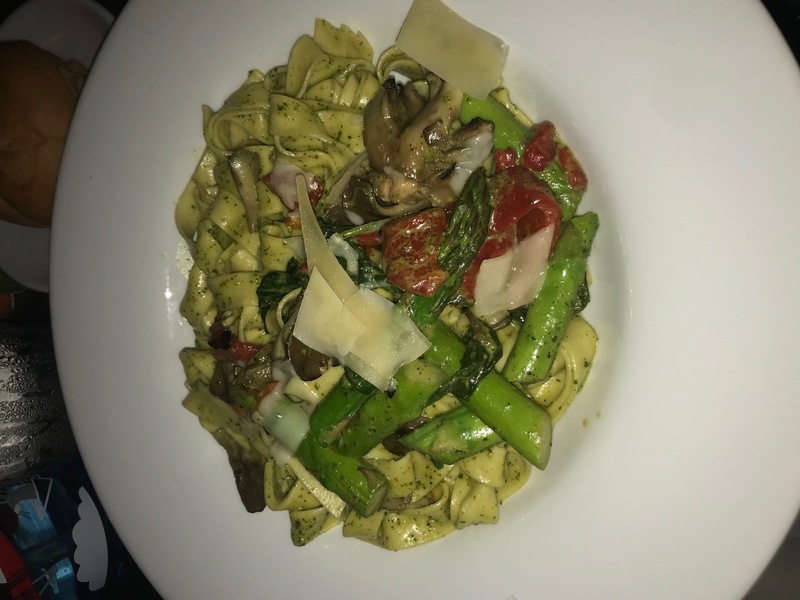 I thoroughly enjoyed the Vegetable Pasta that was draped in a pesto cream sauce. For such a large portion, I’m embarrassed to admit how much I ate! Calories don’t count at Disneyland, right?? The Surf & Turf was also quite tasty. It consisted of a buttery lobster tail, a petite filet mignon topped with a cabernet sauce, and cheesy au gratin potatoes…apparently there were also vegetables, but who pays attention to that when you have lobster!? One of the kids had the Mickey’s Cheesy Macaroni, of course. My child with food allergies had chicken and plain pasta, which is her favorite meal anywhere we go. And all the bread! If that meal wasn’t decadent enough, we finished it off with Gingerbread Creme Brûlée, a Sorcerer Mickey pound cake with a banana foster center, fondant chocolate cake, and sorbet for the kiddo with food allergies. Don’t judge. Remember, no calories. 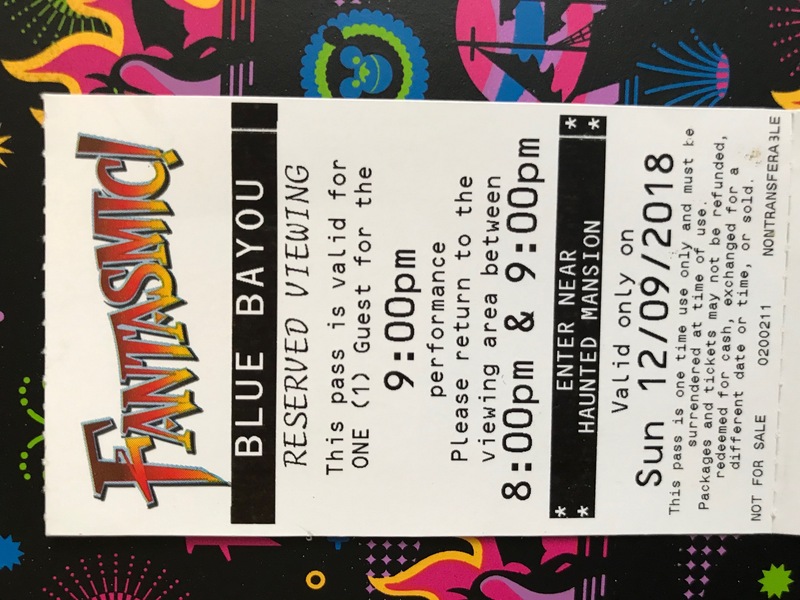 After we paid for our meal, the server gave each of us a voucher for the Fantasmic! reserved viewing area and a fun, Fantasmic-inspired padded cushion to sit on during the performance. While sitting on the ground is never extremely enjoyable, this cushion does seem to prevent the numbness that often occurs after sitting on the cold ground for an hour or more! Request a waterside table upon check-in. Anyone can sit at those tables, but it may take longer to be seated. Go during non-traditional meal times to decrease your chances of a long wait. 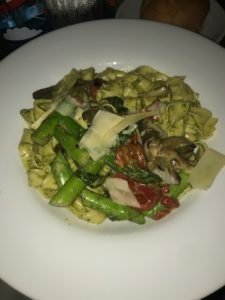 Remind the host/ess of any food allergies you listed in your reservation, and also make them aware of ones that may have been included under “other” in your reservation. If the dining package menu doesn’t have allergy-safe options for you, then request an allergy menu and/or ask to speak to the chef. The reserved viewing area for the Blue Bayou Restaurant dining package is near the Haunted Mansion. If you are unsure of where to go, just ask any of the nearby cast members. The vouchers told us what time range to be there, which was an hour before Fantasmic! began. We usually send at least one person to “linger” around the reserved viewing area about thirty to forty-five minutes prior to the stated time on the voucher. Even when they tell guests not to arrive early, people always do! We like to sit in the front row to get the best view, but if that doesn’t matter to you, then feel free to wait until the time on voucher. While one or two people are saving viewing spots, the rest of the group can continue to ride nearby attractions. Fantasmic! is a twenty-seven minute live show starring Mickey Mouse. Set on the Rivers of America, Fantasmic! is filled with spectacular special effects, beloved Disney princesses, and swashbuckling pirates, as Mickey uses the power of his imagination to conquer his foes. Regardless of how many times I have seen Fantasmic!, it still brings a smile to my face and goosebumps on my arms. I highly recommend it! Send someone to “hang around” the reserved viewing area at least thirty to forty-five minutes before the time on the voucher. Depending on which dining package you select, use the cushions or bring a small blanket to save space while the rest of the group is away having fun (hopefully that is you!). If there are two performances scheduled on a given night, consider selecting a dining time that corresponds with the first performance. It is often best for young (and probably tired) kids…let’s be real, I really mean exhausted parents. In addition, fireworks usually follow the first performance, and they can be watched from your Fantasmic location. Lunch and early dinner reservations are usually associated with the first show. Fantasmic can be loud and scary for some kids. There is fire, loud noises, and scary villains. I bring noise canceling headphones for any young children with us, and it seems to help a lot. These are the ones that we use. Yes. 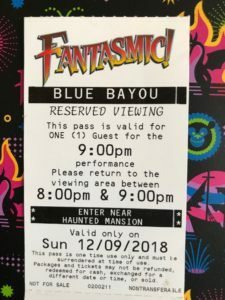 If you want to see Fantasmic!, then I would recommend a dining package. Space is guaranteed and they offer the best viewing options. 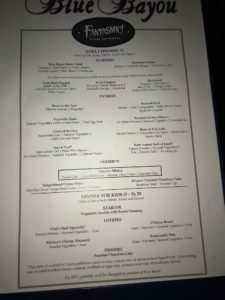 Blue Bayou is a great choice if you already planned to eat there, but if not, the River Belle Terrace or Hungry Bear provide great alternatives at lower prices. For more information on the River Belle Terrace option, read Pin Trading Diva’s article. Important Note: Fantasmic! is scheduled to be closed for refurbishment from January 21 to Spring, 2019. Keep checking the Disneyland Resort website to see when it will be returning! Have you seen Fantasmic!? What do you think about it’s dining packages? And, for help planning your next Disneyland Resort vacation, be sure to contact Patricia at All for Dreams Travel!